VITOMIN 120 capsules, is a complex of vitamins and minerals that can and get in Nutrición24, it is designed to be able to provide all the vitamins and minerals you need for the proper functioning of the body. 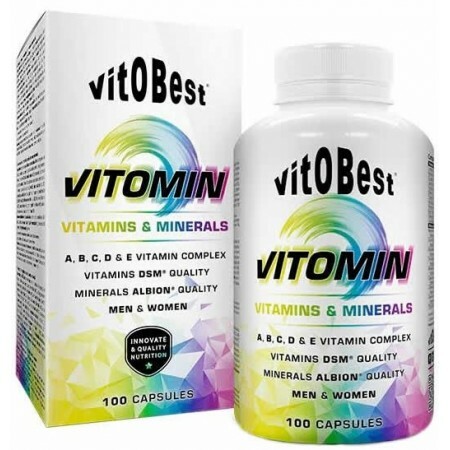 Vitomin Vit.O.Best laboratories 120 capsules helps metabolize carbohydrates, proteins and also helps that there is no deficiency when you train. It contains vitamins such as Vitamin C, Vitamin A, Vitamin B1, Vitamin B2, Vitamin B3, Vitamin B5, Vitamin B6, Vitamin B9, vitamin B12, vitamin E, vitamin D3, and biotin. Minerals such as zinc, iron, manganese, copper, and selenium as are also included. 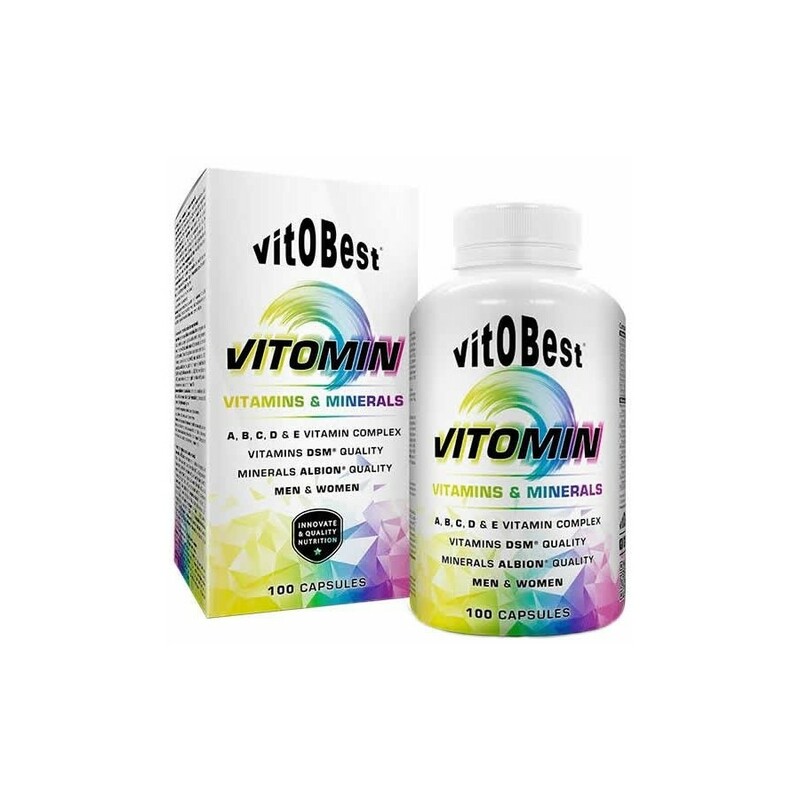 The combination of these vitamins and minerals makes the formula that brings Vitomin cover the basic needs of the nutrients that are essential for the body, especially if you are under physical stress. For the body of an athlete, the food is the main source of protein and energy. In addition to these nutrients, micronutrients also found in food, vitamins and minerals, which are necessary for normal functioning of the body, especially those associated with adaptation to physical effort and athletic performance. 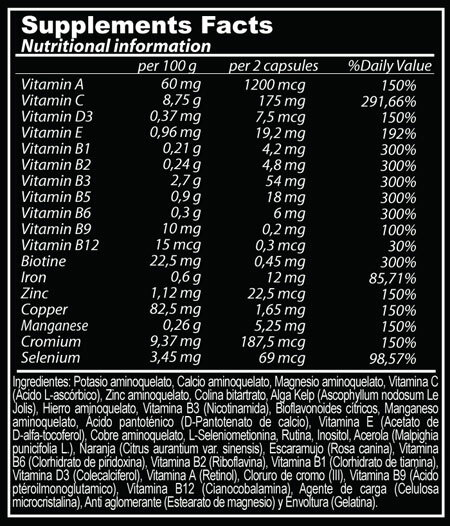 When we started a training program, you should incorporate into our daily diet is a multivitamin preparation as Vitomin. This trigger is useful to not reduce our ability to work or physical and mental adjustment. Vitomin Vit.O.Best laboratory, provides all the minerals and nutrients needed for the proper functioning of our body and also prevents deficiencies have these minerals or nutrients. It is ideal for people who have a high physical exhaustion such as athletes or people who are also subjected to high physical energy and wear due to their activities. Vitomin covers 100% of all the body's needs in these states of physical or mental stress. Vit.O.Best is an experienced company, engaged in the production of sports nutrition products. Offering high quality products, made with the best raw materials, the best results at a good price. 1200 mcg vitamin A; Vitamin C 175mg; 7,5mcg vitamin D3; Vitamin B1 4.2 mg; 4.8 mg vitamin B2; Vitamin B3 54mg; 18 mg vitamin B5; 6 mg vitamin B6; 0.2 mg vitamin B9; 0.3 mcg vitamin B12; Biotin 0.45 mg; Iron 12mg; Zinc 22.5 mcg; 1.65 mg copper; Manganese 5.25 mg; 187.5 mcg chromium; Selenium 69 mcg. Aminoquelato potassium, calcium aminoquelato, aminoquelato Magnesium, Vitamin C, Zinc aminoquelato, Hill Bitartro, Kelp, aminoquelato iron, Vitamin B3, citrus bioflavonoids, aminoquelato manganese, pantothenic acid, vitamin E, copper aminoquelato, L-selenomethionine, Routine, Inositol, acerola, orange, rose hips, Vitamin B6, Vitamin B2, Vitamin B1, Vitamin D3, Vitamin A, chromium chloride, vitamin B9, vitamin B12, bulking agent, anti binder, and envoluta (gelatin). Take one capsule at breakfast and one capsule at dinner.